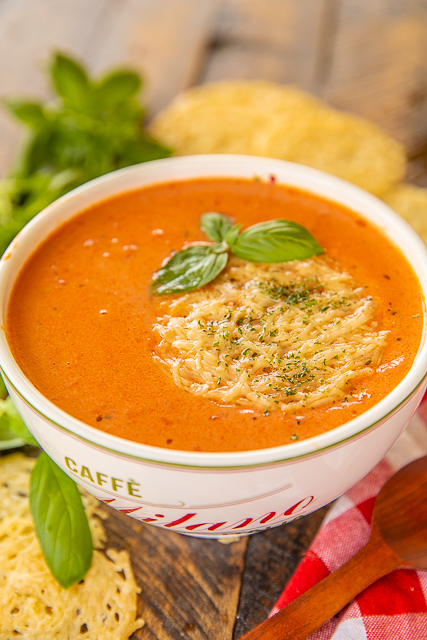 Creamy Tomato Soup is my favorite. I grew up eating canned tomato soup with milk. I LOVED it! This Creamy Tomato Soup is a grown-up version of the stuff I ate as a kid. No canned soups involved. Just crushed tomatoes, tomato juice, seasonings and heavy cream. Perfection! I added a dash of red pepper flakes. It wasn't enough to make this spicy, just enough to give it a little extra flavor. Feel free to leave it out if you are worried about the heat. 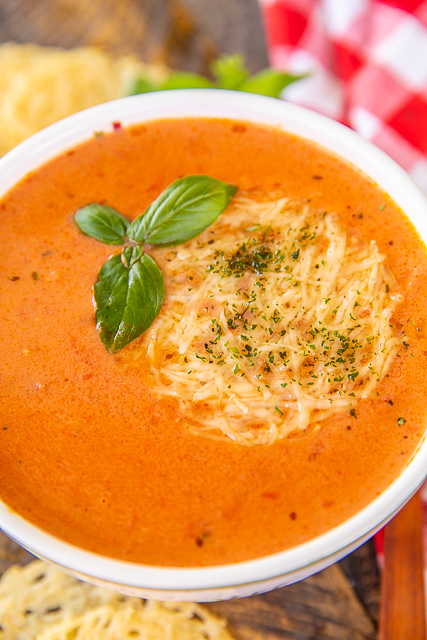 We served this Creamy Tomato Soup with some easy parmesan crisps. To make the parmesan crisps, heat the oven to 400ºF. 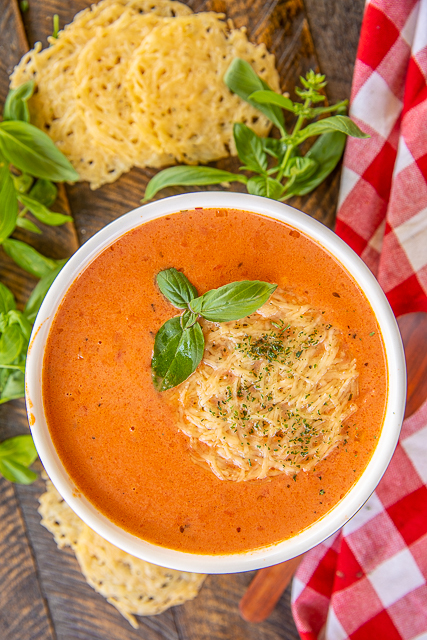 Arrange fresh shredded parmesan cheese in a circle on a parchment lined baking pan and bake for 5 minutes. Feel free to sprinkle the crisps with some garlic or Italian seasoning. 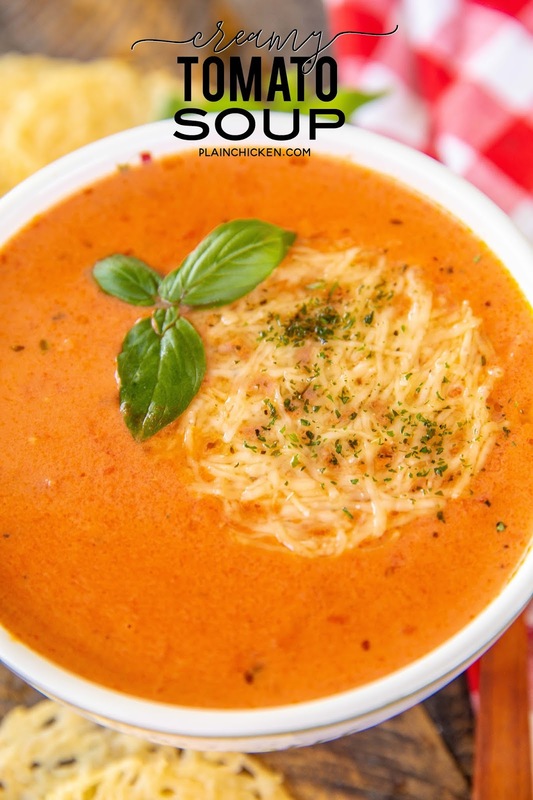 This Creamy Tomato Soup really hit the spot. 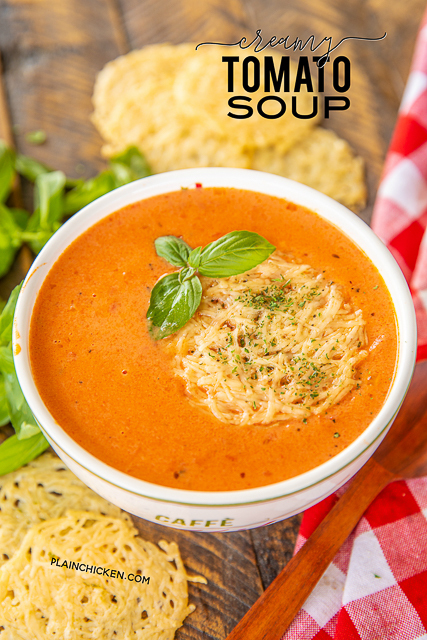 It is perfect for chilly nights or when you are just craving a bowl of delicious soup. It is so easy to make and is ready in under 20 minutes. You really can't beat quick, easy AND delicious! Woohoo! In a Dutch oven over medium high heat, melt butter. Add shallot and cook until starting to soften. Add garlic. Cook for an additional 30 seconds. Add remaining ingredients and cook just until it starts to boil. Reduce heat to simmer and cook for 15 minutes. Can you make this with milk instead of heavy cream? If so, what % milk? Do you pUT this in a blender or do you leave chunks of tomatoes? The crushed tomatoes aren’t really chunky. I did not use a blender, but you certainly can if you would like.